What is a customisation puzzle, you may ask? 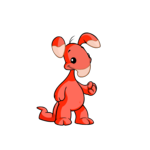 A customisation puzzle is where I will give you a theme, neopets species and what type of items it takes to complete it, and you try to guess what wearable items and pet color will complete it. Now, I will provide hints to help you out. If you can't guess it, then the solutions will be at the bottom of the page. Customisation puzzles are also a fun way to challenge your friends and to see who can correctly guess the puzzle with the fewest hints. Each one will have a difficulty rating (easy, medium and hard) where puzzles with a few items to complete or that use a full costume set will be marked as easy, while others using many items and a range of clothes will be marked as hard, as you need to use your imagination to complete them. I will give you five puzzles to solve. Good luck! #1: My first uh-oh. Species: Lupe. Difficulty: Easy. You're trying to guess the: Trinket and Background. Color hint #1: A Hidden Tower paintbrush. Color hint #2: It will make your lupe look cute and cuddly. Trinket hint #1: Very easy to get as the second hand shoppe is filled with now a days. Trinket hint #2: It has been turned into a variety of foods which you must be nuts to eat unless you are a Buzz. Background hint #1: Ahh... Home sweet home. Nothing beats that. #2: Deep Sea Treasures. Species: Shoyru. Difficulty: Easy. You're Looking For: Trinket and Background. Colour Hint #1: One of the more expensive paintbrushes. It costs about five million neopoints. Colour hint #2: Another world colour. It is the same world that not only showed us where the Battledome is but it also disappeared for a while, only to reappear and get attacked by pirates again. Background trinket #1: This is a nice background for your pet and it is a bit easy to get a hold of thanks to the Daily Dare. Background #2: You have to dive in deep to get all of this treasure. Trinket #1: A NC mall item. It fits in nicely with the theme. Trinket #2: This chest may be a toy, but with so much gold in it, who cares? #3: A perfect princess birthday party. Spices: Zafara. Difficulty: Medium. You're looking for: Background, trinket, gown and hat. Colour hint #1: Another Hidden Tower colour that is fit for royalty. Gown and hat hint #1: The hat and gown are a complete set. Gown and hat hint #2: You can get them only with a paintbrush. Background hint #1: This background was used to help celebrate Neopets's own birthday. Trinket hint #1: Although it is best to get your princess its competitor, this is the only doll your Zafara can wear. Trinket hint #2: This rare collectible comes in its own case and pedestal for the world to see. #4: Sad Valentines Day. Species: Cybunny. Difficulty: Medium. You're looking for: Background, hand held, hat and shirt. Colour hint #1: Your pets must be sad. Well, actually, they are always sad with this colour. Colour hint #2: This is the only colour that your pet mentions when they are sad. Hat hint #1: This Cybunny hat is perfect for a night on the town. Hat hint #2: It comes with a carrot. Shirt hint #1: This Cybunny only shirt is perfect for the special occasions and it will match up with the hat nicely. Hand held hint #1: It is a flower you give to your valentines. Hand held item #2: The Cybunny is sad and so is this item. Background hint #1: It is raining constantly. Background hint #2: Not a NC mall item and it has been released on a paintbrush colour day. #5: A horror dream. Species: Gelert. Difficulty: Hard. You're looking for: Shirt, trousers, mask, shoes, background and wings. Colour hint #1: A world paintbrush. Comes with its own costumes. Colour hint #2: This world's defensive team won the Altador Cup. Mask hint #1: This mask was only released on Halloween. Mask hint #2: This is creepier than all the other masks you get from this goody bag. Shirt hint #1: This was one of the first shirts released when the NC mall first opened up. Shirt hint #2: With this shirt on, you can see your bones. Trousers hint #2: These trousers are related to one of the first shirts released when the NC mall first open up. Trousers hint #2: Wearing this item also lets you see your bones. Wings hint #1: It is a mystery capsule item only. Shoes hint #1: This is one of few items released in the Month of Collecting that you can still get today. Shoes hint #2: It is not as pointy as you thought it was. Background hint #1: This paintbrush colour background is really hot to the touch. Still can't figure out the puzzle? Well, here are the solutions to all five puzzles. Colour: Baby. Trinket: Dung. Background: Neohome background. Colour: Maraqua. Background: Underwater shipwreck background. Trinket: Chest of plunder. #3: A perfect princess birthday party. Colour: Royal. Gown: Royal girl Zafara gown. Hat: Royal Zafara hat. Trinket: Special limited edition fair maiden quiguki doll. Background: 8th birthday celebration background. Colour: Grey. Hat: Black satin Cybunny hat. Shirt: Cybunny tuxedo. Hand held: Single grey flower. Background: A grey day background. Colour. Halloween. Mask: Spooky skull mask. Shirt: Non-Ionising lab ray t-shirt. Trousers: Non-Ionising lab ray pants. Wings: Skeletal wings. Shoes: Pointy claw slippers. Background: Fire painted background. Well, this is the end. I hope you enjoyed solving my customisation puzzles. Keep an eye out for more puzzles to solve in the near future including pet days, holidays and world theme puzzles to solve . Until then, goodbye. Special thanks for Junkholder who help cleared up my article a bit.